In place of a February campout, the Patrol Leaders Council chose to take a day trip on Saturday to the National Infantry Museum at Fort Benning in Columbus, Georgia. The Museum, which opened in 2009, tells the story of U.S. Army Infantrymen from the American Revolution to the present day. The facility hosts over 300,000 visitors every year, including current Fort Benning soldiers, who are required to visit as part of Basic Training. The museum includes both indoor and outdoor exhibits, an IMAX theater, and two interactive simulators. The troop participated in a guided tour of the indoor exhibits and both simulations. 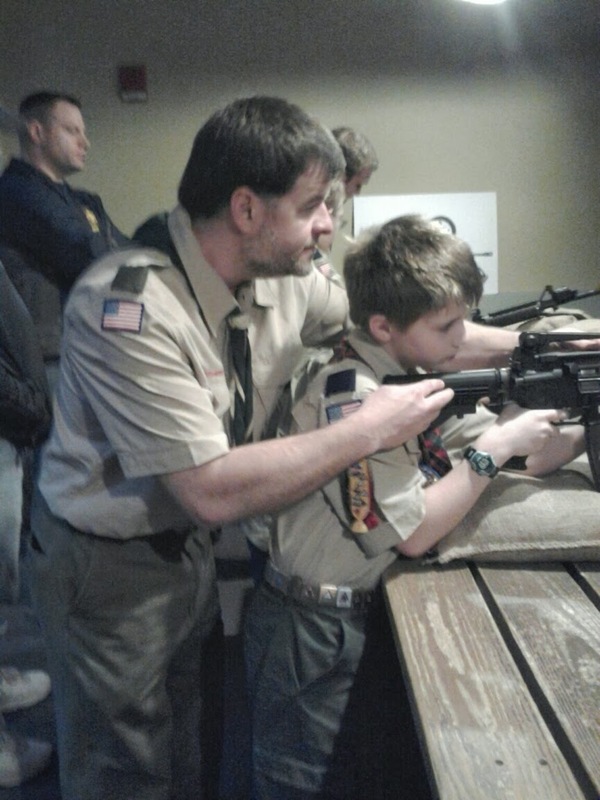 In addition to Troop 50 Scouts, the group also included a number of Webelos Scouts and parents from Packs 29 and 811, who will be joining our troop in the next couple of months. For the simulations, the troop split into two groups. One group headed to the rifle range, where they had the opportunity to shoot simulated M4 rifles. The rifles used lasers to simulate live fire. The second group entered the mission simulator, which featured a three station overwatch post and a simulated Humvee with two seats and a upper gunner's station. Both faced a large three part video projection screen on which the Scouts viewed their scenario. This simulator functioned much like a live action video game. The scenario was a mission to rescue international aid workers who were trapped in a village during an insurgent attack. Both stations viewed the scenario from their own point of view - the Humvee crew as they traversed the landscape in a convoy to rescue the aid workers and the overwatch soldiers as they covered the convoy from above. The scenario ended as they made their way back into the American base. After completing their simulation, the two groups of Scouts swapped places between the rifle range and the mission simulator. Some of the adults also participated in the simulations and everyone agree that they were a blast. Next, our tour guide Tiffany, who is a Scout parent with Troop 128, led us through the various galleries of the museum. We first went through the Last Hundred Yards exhibit. This exhibit gets its name from the fact that the infantry owns the last hundred yards of the battlefield. Airplanes, artillery, and tanks do their part on the battlefield but the infantry directly confronts the enemy in the last hundred yards of the attack. Life-size wax figures portrayed U.S. Army infantry soldiers in combat from the American Revolution, Civil War, World Wars I & II, Korea, Vietnam, and Iraq. It gave the scouts a visual history lesson and an understanding of the sacrifices made for our country. Equally impressive was the parade field that we were shown behind the museum. The field is used for graduation ceremonies from the various programs taught at Benning. Tiffany informed us that dirt collected from all of the battlefields depicted in the Last Hundred Yards exhibit is mixed into the soil on the parade ground. The army now considers it hallowed ground and they only allow veterans and active duty soldiers to enter the field. Following the guided tour, the troop fixed sandwiches for lunch and then spent some free time in the museum or the outdoor exhibits. Overall, the trip provided a good chance for the troop to interact with the Webelos who will soon be part of our unit. At the PLC on Monday evening, the consensus was that this was a great opportunity to learn something and have fun at the same time. Several Scouts mentioned the simulations or various exhibits as their favorites. Vincent told of seeing a statue of Rick Rescorla among the outdoor memorials. Rescorla was a platoon leader in Vietnam who later died on 9/11 after safely evacuating 2700 people from the World Trade Center. John noted that it was "pretty cool" that they had soil from the Last Hundred Yards battlefields spread on the parade field. It seems our trip served to inspire as well as teach everyone about the values we should all aspire to embody. For more photos, see the online photo gallery.